Everything still worked fine but instead of sub-second responses we saw requests taking 9-10 seconds to complete. Further investigation was required. We performed the usual troubleshooting steps but still could not figure out what was going on there. We had to go deeper and deeper in our analysis - eventually all the way to the network packet capture. In fact, it's the packet capture that gave us the first hint of what the problem was. We saw a lot of the TCP retransmissions. Two things were clear for us now. Firstly, we noticed that only the SYN packets had delivery problems and had to be retransmitted. SYN packet is the first packet of a 3 packet "handshake" used to establish a TCP/IP connection. We saw that once the connection was established there were no more retransmissions during the session/data transfer. Secondly, we could see where all those extra seconds were coming from! And then we retransmit again 6 seconds later (packet 23087). After that the connection is finally established but we’ve just lost 3+6=9 seconds during the TCP handshake. Another interesting observation was that when we retransmit for the second time (packet 23087) we remove the ECN and CWR flags. This is where we get 3 seconds (initial retransmission delay) plus 6 seconds (3 seconds doubled for the second retransmission). Once this change went live, straight away we saw request processing time decreasing from 9-10 seconds down to ~6 seconds. We knew we were on the right track. Another suspicious finding (as mentioned above) was that most of the SYN packets with the ECN and CWR flags were dropped while SYN packets without these flags were going through. ECN (Explicit Congestion Notification) is an interesting protocol extension defined in the RFC 3168. In the TCP/IP world the standard way for the receiver to "notify" sender of network congestion is to drop packets. This behaviour obviously can have a significant impact on the overall network performance. ECN (when supported and negotiated by both ends) allows signalling/notification of network congestion to happen without dropping packets. ECN support has improved significantly since the introduction 15 years ago but apparently some issues still exist. 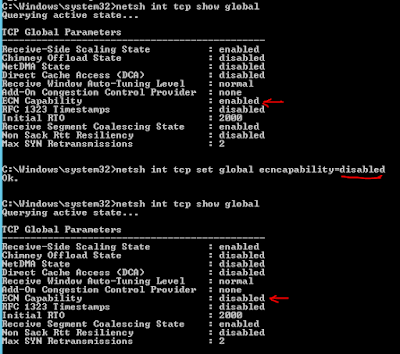 The next step for us was to try to disable ECN to see if this was the culprit. Once this change was applied, all TCP Retransmissions disappeared and request processing time was back to a few hundred milliseconds. We contacted the API vendor and they reassured us that their end had proper ECN support. The fact that not all of the SYN packets with ECN flag had this issue (but most of them), led us to believe that we saw a "Path-dependent connectivity dependency" as described on slide 6. This is also indirectly supported by the fact that some of the BGP routes changed roughly around the same time when we started experiencing this issue. We were happy to see this issue resolved. Hope this blog post will help someone in a similar situation.